On Wednesday 24th April the TUC, Disabled People Against Cuts and Transport for All will be holding a lobby of Parliament from 1.30 – 3.30pm followed by a speak out action at King’s Cross station from 4pm to highlight the impact of railway staff cuts on disabled people. The McNulty Review could lead to over 20,000 job losses including rail guards and staff in ticket offices and on station platforms. The lobby and action will give disabled people the chance to speak out about the importance of customer assistance and rail staff for making rail travel accessible, bringing us together with rail staff who want to be able to give good quality assistance but who are held back by cutbacks and restrictions. We also need your stories and examples of how staff cutbacks will affect you. Please email mail@dpac.uk.net. LET US MARCH PAST LIB-DEM CONFERENCE!!! In a deja vu moment the West Midlands police and the home office have again denied people the right to march in Birmingham – this time past the Lib Dem Party conference on Sunday 18th September. In 2010 the Tories and the West Midlands police prevented Right to Work’s march going past the Tory party conference in the city. Right to Work again initiated this years march but the TUC will act as event organiser and build on the ‘March for the Alternative‘ theme. “For the second year West Midlands Police have confirmed their intention to bar protesters from marching past a major political conference in Birmingham . The police are erecting a “Ring of steel” around the International Convention Centre during the Liberal Democrat Party conference. In 2010 the Con-Dem council and West Midlands police prevented the 7,000 strong Right to Work’s march going past the Tory party conference. The TUC, which represents millions of trade union members, is now organising the protest, initiated by the Right to Work Campaign, at the Lib-Dem conference on 18 September. On 26th March the TUC organised a peaceful demonstration of over 500,000 through Central London . West Midlands Police claim restrictions on the right to protest are about the security of conference delegates. Yet no such restrictions are being placed on the similar demonstration Right to Work has initiated and the TUC are now organising at the Tory Party conference in Manchester . We feel the actions of West Midlands police are a violation of our right to protest peacefully against government policies. Peaceful protest has a central place in any democratic society and people have taken their opposition to government actions to their conferences for decades. The decision of the West Midlands Police takes that right away. We are concerned that West Midlands Police is attempting to make political decisions about how visible protests against the cuts can be. We will be putting the statement on our website asap so that people can sign up. You can download the attached petition to use in your workplace, college, etc. You can also email mail@dpac.uk.net directly to get your name, organisation, etc added. It is over twenty years since a group of disabled trade unionist activists met on the outskirts of Walsall in the West Midlands to establish the Trade Union Disability Alliance. As I recall there were five or six unions represented among the delegates; all of whom had been busily working away in their own union branches and disability committees to either put ‘disability equality’ on the agenda or to encourage their unions to work from a social model perspective. TUDA therefore was set up to support disabled people in the workplace and union activists to spread the message through the trade union movement. It was through the work of TUDA members in MSF and Unison that the TUC passed at its Congress at motion for comprehesive anti-discrimination legislation for disabled people. At the same time they pestered their own union leadership to put pressure on the TUC to set up a Disability Forum and have an annual conference for disabled trade unionists. This was a uphill struggle; whilst not hostile to disabled people, few in the TUC leadership had any understanding of the issues facing people who were a small minority in the workforce and an even smaller number inside the unions. At lot of water has flown under the bridge since then, most unions now have disability committees and the TUC has finally entrusted disabled people to run their own forum. Nevertheless many disabled people still see the trade union movement as rather paternalistic in its approach to disability equality – often more charity model than social model. It is the same with the TUC which has often been compared to an oil tanker – very slow to turn! The decline of the Disabled People’s Movement had an impact upon TUDA’s membership and their influence in the unions and the TUC. It was against this backdrop that DPAC feared the worse when little or information was coming out about the access needs of disabled people wanting to attend the TUC 26th March march. Then we were informed coaches were being parked up on the outskirts of London and trains were already being pre-booked. A letter was send by DPAC voicing our concerns to the TUC’s General Secretary and contact was made with others inside the TUC in an attempt to seek clarification. 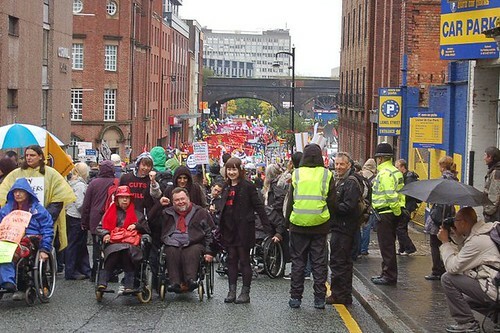 After banging away at the need to include disabled people, DPAC were in contact with an equality officer, then one of the organisers of the March; finally, we were told that the Chair of the TUC’s Disability Forum was making his members’ views known. Slowly, the information DPAC was seeking was released upon a TUC, however we remained concerned about the lack of “inclusivity” with regards to aspects of the organising and said so. After years of campaigning I know change rarely takes place over night and many large insitutions need a great deal of support and encourage in order to “do the right thing”. Living day after day with the impact of social oppression isn’t easy either. Many activists get bruised and brittle, suspecting the worst rather than expecting progress. I believe the last few weeks has asked many questions of both disabled and non-disabled people involved in resisting the cuts. Perhaps if we can learn the lessons from our experiences this will strengthen our ability to take on the real enemy – the Coalition Government! Disabled People Against Cuts (DPAC) are going to take part in the TUC march for the alternative in protest against government cuts. The demonstration is taking place on 26 March 2011 in London. “Disabled people are facing continuing attacks against their lives, living standards and basic human rights to live independently from almost every conceivable quarter and it is time for us to fight back against these cuts,” they explain. “These savage spending cuts damage not only our lives, but our public services, and threaten economic recovery. They’re dangerous, unfair and unnecessary. Follow plans for the day via the facebook event page or via twitter. Latentexistence has written powerfully of the ways in which people can campaign online. 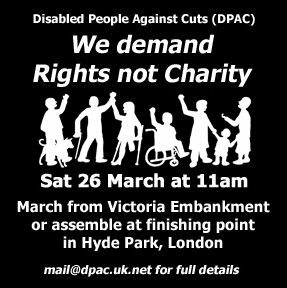 For those who physically cannot make the protest in spite of the TUC access and disability arrangements but would like to make their presence felt, DPAC and Beyond Clicktivism are working together to bring you a way of doing so. Let’s light up a map of the UK online in solidarity with the protesters on 26 March and show our elected representatives quite how many people oppose their unnecessary, ideological reforms. More details will be announced over the next two weeks so follow either or both sites to keep up to date. Volunteers interested in helping with coding and setting up a website are very welcome. Please get in touch with either myself or DPAC to offer your assistance. 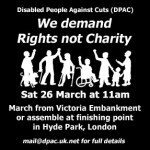 Disabled People Against Cuts (DPAC) believe it is imperative that disabled and older people are afforded the opportunity to support the TUC ‘March for the Alternative’ demonstration on 26 March in central London. At the latest count it was found that disabled people were facing fourteen separate attacks against our lives and living standards as a result of the Coalition government’s policies. What we are witnessing is our human rights, supposedly guaranteed under the United Nations Convention on the Rights of Disabled People, being violated by regressive and draconian cuts to benefit and care funding. Increasing numbers of disabled people are being driven to contemplate suicide; with others actually going the whole way. Members of our community are living in daily terror that they will become further scapegoated, demonised and subjected to hate crime violence. Against this backdrop DPAC demand the right to be fully included in this march and rally as our non-disabled peers would take for granted. As it currently stand the initial planning for the March is creating unnecessary disabling barriers which will both exclude and marginalise disabled people’s ability to participate. So far however the TUC have not responded to any requests from us for support for accessible transport to attend the march and now we have been told that the TUC have agreed (for anyone who can access coaches) that the coach dropping off point will be at Wembley or some other outlying part of London. As I am sure you are aware the London underground system is one of the least accessible in the world, only one wheelchair is allowed on each bus at any one time, and disabled people cannot afford to pay extra travel costs from an outlying suburb to reach the centre of London. To agree to this as a dropping off point will therefore exclude us from exercising our right to protest. It is possible to park in central London without bringing London to a grinding halt. When 2 million marched against the invasion of Iraq in 2003, coaches were parked all around Hyde Park and there were no major problems with people arriving or departing from this historic demonstration. Further we are certain that there must be at least 500 or more tourist coaches entering London on any day which does not seem to cause any traffic problems at all. We have also asked TUC to organise with the police for us to have a static protest in central London for those unable to march but so far have had no response regarding this. We were able to do this very successfully with forward planning at the Tory Party conference protest in Birmingham. Further we would wish to be kept updated with details of where the march will be going so that we can check its accessibility for our members with a range of impairments. Both disabled Trade Unionists and other disabled people who attended The People’s Convention last Saturday asked conference to support a motion that the TUC march would be fully inclusive to all disabled people and that all of the required reasonable adjustments would be put in place by yourselves to fully include all of us. We are willing to work with you to ensure that our full inclusion can be achieved and to assist you in any way practicable. We look forward to your response which we will pass onto disabled people. We are still waiting for a response! Is there a Future for Civil Society? Yesterday I attended an event, ‘Future for Civil Society’ where voluntary sector and trade union speakers warned that the Conservative lead government funding cuts delivered under the heading of the “Big Society” are helping to undermine charitable organisations in the country. Around 150 representatives from charities and unions were there and at this TUC-organised event in London, with speakers unconvinced that the Big Society is anything other than a farce. TUC general secretary Brendan Barber said the conference was part of ongoing efforts to build “the widest possible coalition” against the cuts, involving unions, charities, community groups and faith organisations. The event is focused on service providers and third sector organisations with TUC, DPAC, as representative for service users, does not seem to quite fit into the flow of the discussions. The term ‘ the most vulnerable’ and protecting ‘the most vulnerable’ was touted quite a bit and the question of volunteering – it is not a free resource and needs much support. Cuts in short term may be more expensive in the long run. A report of the event and feedback from the workshops would be available from the organisers later.